I do not have any tattoos, nor does my husband, brother, or parents. The mousetrap that caught me to this picture book, was the match up of author Alison McGhee (Someday, Bink & Gollie) and illustrator Eliza Wheeler (Doll Bones, What does it Mean to be Present). 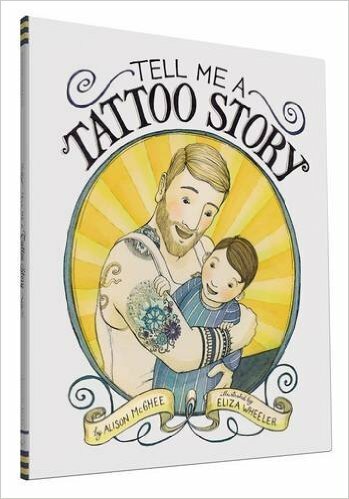 But only a few breathes in did I find joy in the idea of how many kids could see a reflection of the people in their lives in this book, as so many have loved ones with a tattoo. 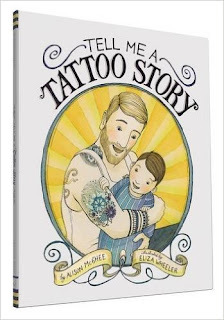 The words and illustrations weave through the ink on a father's body, a historical narrative of a life is shared with a son. Any fan of oral stories and writing will verify the impact of hearing oral stories throughout childhood and life. My father loved to tell me stories about his life. Every tale told again and again, still revealing themselves like a new treasure with every single retell. I can relate to the son's attentive loyalty in this book. McGhee and Wheeler did a seamless partnership in representing this story in such a delicate manner, when so often the images of tattoos are drenched in grit. This belongs in libraries and classrooms, as kids always need access to models in picture books to help validate their understandings of the world they live in. This one is personal for a lot of kids. 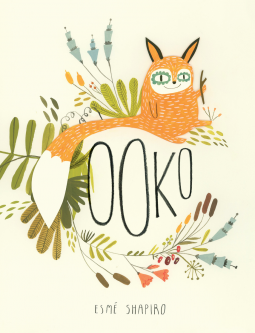 OOKO is an innovative type of picture book. It might join the same collection as, Kyo Maclear and Matte Stephen's Mr. Flux. A picture book that walks away from the ordinary narrative and modern day bling, and lets the reader marinate in a thoughtful pause on every single page. OOKO is a fox that wants a friend. The story unravels his process of changing himself for others to being his best true self and making the best friend of all. While this lesson slowly unearths, a lot of other subtle opportunities to ponder greet you. The illustrations are a juxtaposition of sweet and unconventional. The illustrations begins with tender pastel color toadstools and flowers like Blue Bonnets and red poppies. There are hedgehogs, cattails, and even a fluffy pink poodle. About the time you figure out where the journey might be going, there is a boy wearing bathing trunks with a matching bathing cap and is fishing, to a character with hairy legs and a bun in her hair larger than her head. By the time you read the last sentence, "To each their own." every choice the artist made, makes sense and feels right. I appreciate the level of sophistication and respect it offers young readers. I think the author / illustrator exhibit grit by doing such, and the same time, the delicate art is interesting and poetic. It feels like the artist was joyful while they worked. The font, the full bleeds, are a snapshot of the numerous ways the presentation of this book is appealing.